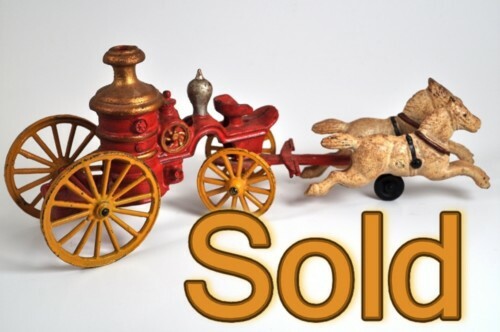 Tom & Teri's Andtiques.com presents a Fabulous Cast Iron Antique Treasure from the estate of a local firefighter who amassed quite a collection of very fine vintage and collectible Fire Memorabilia. This striking horse drawn pumper is in Very, Very Good Condition. Paint is still very nice, the wheels are all intact and turn freely and it is rich in detail, design, and condition. The Pumper Truck is in two parts. The two pieces connect sideways and pivot freely and easily. Weight: Both pieces weight together 2 lbs. & 3 oz. A remarkable price for a cast iron toy truck of this age and in this condition. or photographs of this piece you may need. Vintage & Rare L&N Railroad Lock with 2 Keys Working!